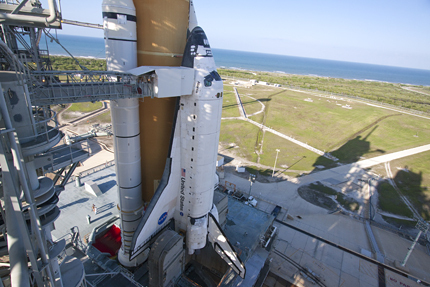 Space shuttle Atlantis is embarking on its final planned mission. During the 12-day flight, Atlantis and six astronauts will fly to the International Space Station, leaving behind a Russian Mini Research Module, a set of batteries for the station's truss and dish antenna, along with other replacement parts. NASA astronaut Ken Ham will command an all-veteran flight crew: Pilot Tony Antonelli, and Mission Specialists Michael Good, Garrett Reisman, Piers Sellers and Steve Bowen. After the final STS-132 Flight Readiness Review, John Shannon, Space Shuttle Program manager, pointed out that Atlantis' last planned mission will be an exciting one. "Twelve days, three [spacewalks], tons of robotics... We're putting on spares that make us feel good about the long-term sustainability of the ISS, replacing batteries that have been up there for a while, and docking a Russian-built ISS module," Shannon said. "This flight has a little bit of everything, and it's been a great preparation for the team."